Un nuovo impegno umanitario internazionale è partito il 7 Giugno dalla città di Palermo. Si tratta di un “Messaggio di Civiltà” contro il turismo sessuale nei confronti dei minori. Ad accogliere l’iniziativa lanciata da Giorgia Butera Presidente Mete Onlus insieme a Sara Baresi Presidente Protea, Associazione per la Tutela dei Diritti dell’Uomo, Italia e Consulente Mete per i Paesi del Maghreb e l’Avvocato Tiziana Barrella,Responsabile Scientifico, Osservatorio Giuridico Italiano , è stato l’Aeroporto di Palermo “Falcone e Borsellino”, dove sono stati esposti dei manifesti. La H.R.Y.O. ha sottoscritto il manifesto e sostiene la campagna sin dal suo nascere. Secondo stime dell’Organizzazione Mondiale del Turismo ogni anno almeno 3 milioni di persone partono per viaggi a scopo sessuale. 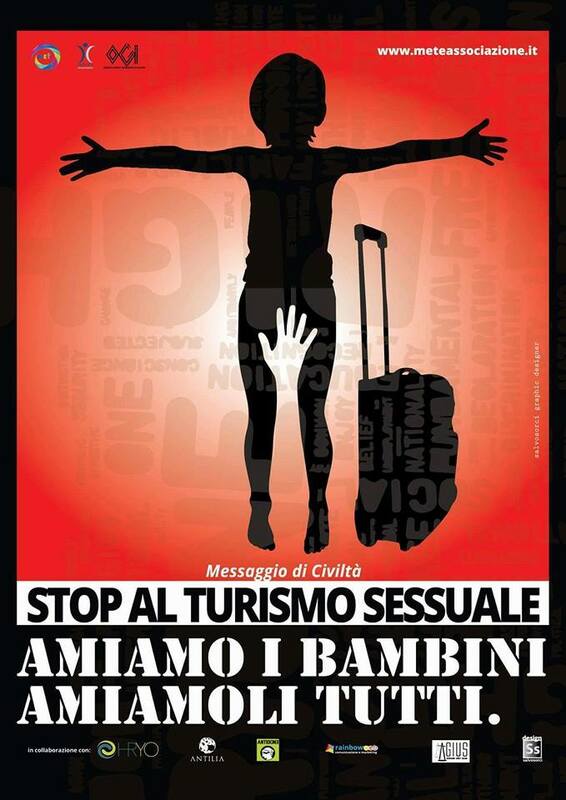 Il turismo sessuale nei confronti dei bambini e delle bambine è pedofilia tollerata. Continuare a leggere e diffondere dati allarmanti, ed allo stesso tempo negare azioni concrete ed interventi mirati da parte di quelle realtà che hanno il dovere di occuparsene, provoca sentimenti di profonda indignazione. La negazione porta ad uno stato di accettazione passiva. Giorgia Butera dichiara : “Tutti i bambini e le bambine hanno il diritto ad essere amati. Non possiamo accettare che al mondo (tanti tantissimi) vengano abusati, violentati e sfruttati perché figli della povertà economica e sociale. Da oggi, inizia un nuovo ed importante impegno umanitario internazionale. Ringraziamo la Società Gesap per aver accolto il nostro invito ad esporre il manifesto. Abbiamo ricevuto gli auguri di buon lavoro da parte del Presidente Enac, Vito Riggio, con l’apertura al coinvolgimento di tutti gli aeroporti italiani acciocchè possano esporre il manifesto”. L’Avvocato Tiziana Barrella (Responsabile Scientifico, Osservatorio Giuridico Italiano) ha manifestato quelli che saranno i primi step della progettualità, sia in ambito nazionale sia internazionale. L’azione sarà svolta sia in termini legislativi-proceduali, sanitari e di educazione; all’interno della progettualià è già stato inserita l’applicazione “Doctor Chat”. L’autore del manifesto è Salvo Sorci. Salvo Sorci, laureato e specializzato in Arti Visive e Discipline dello Spettacolo indirizzo Decorazione e Arti Applicate alla Tecnologia all’Accademia di Belle Arti di Palermo. Artista Contemporaneo con lavori esposti in tutta Europa agisce come Grafico Creativo, allestimento, organizzazione, responsabile dell’immagine & direzione artistica con associazioni culturali “Compagnia delle Arti” ,”Antilia” & “METE Onlus” ed eventi promossi tramite il Comune di Palermo. I simply want to mention I am just new to blogs and certainly savored your blog site. Likely I’m planning to bookmark your blog . You absolutely come with good writings. Cheers for revealing your blog. Normally I don’t learn post on blogs, however I would like to say that this write-up very pressured me to take a look at and do it! Your writing taste has been amazed me. Thanks, quite great post. You really make it appear so easy with your presentation but I to find this topic to be really one thing that I think I might never understand. It sort of feels too complicated and very extensive for me. I’m having a look ahead to your next publish, I¡¦ll attempt to get the hang of it! Hiya, I am really glad I’ve found this info. Today bloggers publish just about gossip and net stuff and this is actually annoying. A good site with exciting content, that’s what I need. Thank you for making this site, and I’ll be visiting again. Do you do newsletters by email? Hello there. I found your blog by means of Google at the same time as searching for a related subject, your website came up. It appears to be great. I have bookmarked it in my google bookmarks to come back then. Hello there. I discovered your web site by means of Google at the same time as searching for a similar matter, your website got here up. It seems to be good. I have bookmarked it in my google bookmarks to visit then. Hi there. I discovered your blog by the use of Google whilst searching for a related topic, your site came up. It seems good. I’ve bookmarked it in my google bookmarks to come back then. Hiya, I’m really glad I’ve found this info. Today bloggers publish just about gossip and web stuff and this is actually annoying. A good blog with exciting content, that is what I need. Thank you for making this website, and I’ll be visiting again. Do you do newsletters by email? Hi there. I found your website via Google at the same time as looking for a related subject, your web site came up. It seems great. I’ve bookmarked it in my google bookmarks to come back then. Hiya, I’m really glad I have found this information. Today bloggers publish just about gossip and internet stuff and this is really irritating. A good site with interesting content, that is what I need. Thank you for making this website, and I’ll be visiting again. Do you do newsletters by email? Hiya, I’m really glad I have found this information. Today bloggers publish only about gossip and web stuff and this is actually irritating. A good web site with interesting content, that is what I need. Thanks for making this site, and I’ll be visiting again. Do you do newsletters by email? Hi there. I discovered your site by way of Google even as searching for a related subject, your site got here up. It seems to be good. I’ve bookmarked it in my google bookmarks to visit then. Hiya, I am really glad I have found this information. Nowadays bloggers publish only about gossip and net stuff and this is actually irritating. A good website with interesting content, that is what I need. Thank you for making this website, and I will be visiting again. Do you do newsletters by email? hi!,I like your writing so so much! share we be in contact more approximately your article on AOL? I need an expert in this area to unravel my problem. Maybe that’s you! Taking a look forward to look you. You can definitely see your skills in the work you write. The sector hopes for even more passionate writers like you who aren’t afraid to mention how they believe. Always follow your heart. Hi there. I discovered your site by the use of Google while looking for a comparable subject, your site came up. It appears great. I’ve bookmarked it in my google bookmarks to visit then. Hey there. I found your site by means of Google even as searching for a comparable matter, your site came up. It looks good. I’ve bookmarked it in my google bookmarks to come back then. Hiya, I am really glad I’ve found this information. Nowadays bloggers publish only about gossip and internet stuff and this is really annoying. A good site with interesting content, that’s what I need. Thank you for making this web-site, and I will be visiting again. Do you do newsletters by email? Hey there. I discovered your web site by way of Google whilst searching for a similar subject, your web site got here up. It looks good. I’ve bookmarked it in my google bookmarks to come back then. Hiya, I am really glad I have found this information. Nowadays bloggers publish only about gossip and internet stuff and this is really irritating. A good web site with exciting content, that’s what I need. Thank you for making this web-site, and I’ll be visiting again. Do you do newsletters by email? Hi there. I discovered your blog by way of Google even as looking for a similar matter, your website got here up. It seems good. I’ve bookmarked it in my google bookmarks to visit then. Hey there. I discovered your site by way of Google at the same time as looking for a similar matter, your website got here up. It seems good. I’ve bookmarked it in my google bookmarks to come back then. Hello there. I discovered your site by means of Google even as looking for a related subject, your website got here up. It appears great. I have bookmarked it in my google bookmarks to visit then. Hey there. I discovered your blog via Google whilst searching for a related matter, your site got here up. It looks good. I have bookmarked it in my google bookmarks to come back then. Hello there. I found your website via Google at the same time as looking for a similar subject, your web site got here up. It looks great. I have bookmarked it in my google bookmarks to visit then. Hiya, I’m really glad I have found this information. Nowadays bloggers publish only about gossip and internet stuff and this is really annoying. A good web site with exciting content, that’s what I need. Thanks for making this website, and I’ll be visiting again. Do you do newsletters by email? Hey there. I discovered your blog by means of Google even as searching for a comparable matter, your site came up. It seems to be great. I have bookmarked it in my google bookmarks to visit then. Hi there. I discovered your web site by the use of Google at the same time as searching for a comparable subject, your site got here up. It looks great. I’ve bookmarked it in my google bookmarks to come back then. Great goods from you, man. I’ve understand your stuff previous to and you are just extremely magnificent. I really like what you have acquired here, really like what you’re stating and the way in which you say it. You make it enjoyable and you still take care of to keep it sensible. I can’t wait to read far more from you. This is really a great website. Hey there. I found your site via Google at the same time as looking for a similar matter, your web site came up. It appears great. I have bookmarked it in my google bookmarks to visit then. Hiya, I’m really glad I have found this information. Nowadays bloggers publish only about gossip and web stuff and this is actually irritating. A good site with exciting content, that is what I need. Thank you for making this site, and I will be visiting again. Do you do newsletters by email? Hey there. I found your site via Google even as looking for a comparable topic, your web site got here up. It appears to be good. I have bookmarked it in my google bookmarks to visit then. Hiya, I’m really glad I have found this info. Nowadays bloggers publish only about gossip and internet stuff and this is really irritating. A good site with exciting content, this is what I need. Thanks for making this web-site, and I’ll be visiting again. Do you do newsletters by email? Hey there. I found your web site by way of Google at the same time as searching for a comparable topic, your web site came up. It looks good. I have bookmarked it in my google bookmarks to visit then. Hiya, I am really glad I’ve found this info. Nowadays bloggers publish just about gossip and net stuff and this is actually frustrating. A good site with exciting content, that is what I need. Thank you for making this website, and I’ll be visiting again. Do you do newsletters by email? Hiya, I am really glad I’ve found this info. Today bloggers publish only about gossip and web stuff and this is really annoying. A good blog with interesting content, this is what I need. Thanks for making this website, and I will be visiting again. Do you do newsletters by email? Hiya, I am really glad I have found this info. Nowadays bloggers publish only about gossip and internet stuff and this is actually annoying. A good web site with exciting content, that’s what I need. Thanks for making this site, and I will be visiting again. Do you do newsletters by email? Thank you, I’ve recently been searching for info approximately this topic for a while and yours is the best I’ve discovered so far. However, what in regards to the conclusion? Are you certain in regards to the supply? Hiya, I’m really glad I have found this info. Nowadays bloggers publish only about gossip and web stuff and this is actually annoying. A good website with exciting content, that’s what I need. Thanks for making this site, and I will be visiting again. Do you do newsletters by email? Hello there. I found your blog by means of Google whilst looking for a related subject, your website came up. It seems to be great. I have bookmarked it in my google bookmarks to come back then. Hello there. I found your website by means of Google whilst looking for a related topic, your web site came up. It appears to be good. I have bookmarked it in my google bookmarks to come back then. Hi there. I discovered your web site via Google at the same time as looking for a related topic, your web site got here up. It appears to be good. I’ve bookmarked it in my google bookmarks to come back then. Hiya, I’m really glad I’ve found this information. Today bloggers publish only about gossip and internet stuff and this is actually irritating. A good website with interesting content, that is what I need. Thanks for making this web-site, and I will be visiting again. Do you do newsletters by email? Hello there. I found your web site via Google at the same time as searching for a related matter, your web site came up. It seems good. I’ve bookmarked it in my google bookmarks to visit then. Hey there. I discovered your website via Google at the same time as searching for a comparable subject, your site came up. It appears good. I have bookmarked it in my google bookmarks to visit then. Hi there. I found your blog via Google whilst looking for a related subject, your web site got here up. It seems to be good. I’ve bookmarked it in my google bookmarks to visit then. Hi there. I found your blog by means of Google while looking for a related topic, your website came up. It appears good. I’ve bookmarked it in my google bookmarks to come back then. Hiya, I am really glad I’ve found this information. Today bloggers publish just about gossip and net stuff and this is really annoying. A good site with interesting content, that is what I need. Thank you for making this web-site, and I’ll be visiting again. Do you do newsletters by email? Hi there. I discovered your blog by the use of Google whilst looking for a related topic, your website got here up. It looks good. I have bookmarked it in my google bookmarks to come back then. Hi there. I discovered your website by the use of Google at the same time as searching for a related subject, your website came up. It seems to be good. I have bookmarked it in my google bookmarks to come back then. Hiya, I am really glad I’ve found this information. Today bloggers publish only about gossip and net stuff and this is really annoying. A good web site with interesting content, this is what I need. Thanks for making this web-site, and I will be visiting again. Do you do newsletters by email? Hey there. I found your web site via Google even as looking for a comparable subject, your website got here up. It appears to be great. I have bookmarked it in my google bookmarks to visit then. Hey there. I discovered your website by the use of Google even as looking for a similar topic, your web site came up. It seems to be good. I’ve bookmarked it in my google bookmarks to visit then. Hiya, I am really glad I’ve found this info. Nowadays bloggers publish only about gossip and web stuff and this is actually frustrating. A good blog with exciting content, that’s what I need. Thanks for making this website, and I’ll be visiting again. Do you do newsletters by email? Hi there. I found your website by way of Google even as searching for a related subject, your web site came up. It looks good. I have bookmarked it in my google bookmarks to visit then. Hey there. I discovered your site by means of Google while searching for a similar matter, your website came up. It looks good. I have bookmarked it in my google bookmarks to come back then. Hey there. I discovered your blog by means of Google whilst looking for a related subject, your site came up. It seems good. I have bookmarked it in my google bookmarks to visit then. Hey there. I discovered your web site via Google while looking for a related topic, your site got here up. It appears to be great. I have bookmarked it in my google bookmarks to come back then. Hi there. I found your web site by the use of Google whilst looking for a similar subject, your site came up. It appears good. I have bookmarked it in my google bookmarks to visit then. Hey there. I discovered your blog by way of Google at the same time as searching for a similar topic, your site came up. It appears good. I’ve bookmarked it in my google bookmarks to visit then. Hello there. I found your site by way of Google even as looking for a similar topic, your site got here up. It looks great. I’ve bookmarked it in my google bookmarks to visit then. Hi there. I discovered your site by means of Google even as looking for a related matter, your site got here up. It seems to be good. I have bookmarked it in my google bookmarks to visit then. Hi there. I found your blog by means of Google even as searching for a related matter, your site got here up. It seems good. I have bookmarked it in my google bookmarks to visit then. Hiya, I am really glad I have found this info. Nowadays bloggers publish just about gossip and internet stuff and this is really frustrating. A good web site with interesting content, this is what I need. Thank you for making this web-site, and I will be visiting again. Do you do newsletters by email? Hello there. I discovered your blog by means of Google even as searching for a similar topic, your web site came up. It appears to be good. I have bookmarked it in my google bookmarks to come back then. Hiya, I am really glad I’ve found this info. Nowadays bloggers publish just about gossip and net stuff and this is really frustrating. A good site with exciting content, this is what I need. Thank you for making this website, and I will be visiting again. Do you do newsletters by email? Hey there. I found your blog by way of Google at the same time as searching for a related topic, your site came up. It seems good. I’ve bookmarked it in my google bookmarks to visit then. Hello there. I found your web site by the use of Google while searching for a related subject, your site came up. It looks great. I’ve bookmarked it in my google bookmarks to come back then. Hello there. I discovered your site by the use of Google even as searching for a similar topic, your website got here up. It seems to be good. I’ve bookmarked it in my google bookmarks to come back then. Hi there. I discovered your site via Google while searching for a comparable topic, your site got here up. It seems to be great. I have bookmarked it in my google bookmarks to visit then. Hiya, I am really glad I have found this info. Today bloggers publish just about gossip and net stuff and this is actually annoying. A good blog with interesting content, this is what I need. Thank you for making this web-site, and I will be visiting again. Do you do newsletters by email? Hey there. I found your web site by means of Google even as searching for a similar matter, your web site got here up. It appears to be great. I have bookmarked it in my google bookmarks to visit then. Hello there. I discovered your blog by the use of Google whilst looking for a related matter, your site came up. It seems to be great. I’ve bookmarked it in my google bookmarks to come back then. Hey there. I found your website by means of Google at the same time as searching for a comparable matter, your web site came up. It seems to be great. I have bookmarked it in my google bookmarks to visit then. Hello there. I found your website by means of Google at the same time as looking for a similar matter, your web site came up. It seems great. I’ve bookmarked it in my google bookmarks to visit then. Hi there. I found your website by way of Google while looking for a comparable matter, your site got here up. It appears good. I have bookmarked it in my google bookmarks to come back then. Hiya, I am really glad I’ve found this info. Today bloggers publish just about gossip and net stuff and this is actually frustrating. A good website with exciting content, that’s what I need. Thanks for making this site, and I’ll be visiting again. Do you do newsletters by email? Hey there. I found your site by way of Google at the same time as searching for a related subject, your web site got here up. It appears to be great. I have bookmarked it in my google bookmarks to come back then. Hello there. I discovered your blog by means of Google even as searching for a comparable topic, your web site got here up. It seems to be good. I have bookmarked it in my google bookmarks to visit then. Hiya, I am really glad I have found this information. Nowadays bloggers publish only about gossip and net stuff and this is really annoying. A good site with exciting content, that is what I need. Thank you for making this web site, and I will be visiting again. Do you do newsletters by email? Hi there. I discovered your website via Google at the same time as looking for a similar topic, your site came up. It appears good. I have bookmarked it in my google bookmarks to visit then. Hello there. I discovered your blog via Google whilst looking for a similar topic, your website got here up. It seems great. I’ve bookmarked it in my google bookmarks to come back then. Needed to put you that very small note in order to thank you very much as before for all the pleasing things you’ve featured on this page. It has been really strangely open-handed of people like you to grant without restraint exactly what a lot of people would have marketed for an ebook to end up making some cash for themselves, certainly considering the fact that you could possibly have done it in the event you desired. The guidelines in addition acted to become good way to be sure that some people have the same dream much like my very own to understand significantly more with reference to this condition. I think there are some more pleasurable moments in the future for folks who looked at your blog post. Hey there. I discovered your blog by way of Google at the same time as searching for a similar matter, your site came up. It appears good. I’ve bookmarked it in my google bookmarks to come back then. Hi there. I found your blog by the use of Google whilst looking for a similar matter, your website came up. It appears great. I’ve bookmarked it in my google bookmarks to come back then. Hi there. I discovered your web site by the use of Google while searching for a comparable matter, your site came up. It looks great. I have bookmarked it in my google bookmarks to visit then. hello there and thank you for your info – I’ve certainly picked up anything new from right here. I did however expertise several technical points using this website, as I experienced to reload the web site lots of times previous to I could get it to load properly. I had been wondering if your web hosting is OK? Not that I am complaining, but sluggish loading instances times will often affect your placement in google and can damage your high quality score if advertising and marketing with Adwords. Well I am adding this RSS to my email and could look out for much more of your respective exciting content. Make sure you update this again soon..
Hiya, I am really glad I have found this info. Today bloggers publish just about gossip and net stuff and this is actually frustrating. A good website with interesting content, that is what I need. Thanks for making this web site, and I will be visiting again. Do you do newsletters by email? Hiya, I’m really glad I have found this info. Today bloggers publish only about gossip and internet stuff and this is really irritating. A good web site with exciting content, that is what I need. Thanks for making this web site, and I will be visiting again. Do you do newsletters by email? Hiya, I’m really glad I’ve found this info. Today bloggers publish just about gossip and internet stuff and this is actually annoying. A good blog with interesting content, that’s what I need. Thanks for making this website, and I’ll be visiting again. Do you do newsletters by email? Hi there. I found your web site by the use of Google even as searching for a related matter, your site came up. It appears great. I’ve bookmarked it in my google bookmarks to visit then. Hello there. I found your website by way of Google even as looking for a similar subject, your web site got here up. It looks good. I have bookmarked it in my google bookmarks to come back then. Hello there. I found your web site by means of Google at the same time as searching for a comparable topic, your website got here up. It looks good. I’ve bookmarked it in my google bookmarks to come back then. Hello there. I found your site by means of Google whilst searching for a related subject, your site got here up. It appears to be great. I have bookmarked it in my google bookmarks to visit then. Hey there. I discovered your site by means of Google while looking for a comparable subject, your website came up. It seems great. I’ve bookmarked it in my google bookmarks to visit then. you’re truly a just right webmaster. The web site loading speed is amazing. It seems that you’re doing any unique trick. Also, The contents are masterwork. you have performed a fantastic process in this matter! Hiya, I am really glad I have found this information. Nowadays bloggers publish just about gossip and net stuff and this is actually frustrating. A good blog with interesting content, this is what I need. Thank you for making this web-site, and I’ll be visiting again. Do you do newsletters by email? Hiya, I’m really glad I’ve found this info. Nowadays bloggers publish just about gossip and net stuff and this is actually annoying. A good website with exciting content, that is what I need. Thanks for making this web site, and I will be visiting again. Do you do newsletters by email? Hey there. I found your website by the use of Google even as searching for a comparable subject, your website came up. It seems to be good. I’ve bookmarked it in my google bookmarks to come back then. Hiya, I am really glad I’ve found this info. Today bloggers publish just about gossip and web stuff and this is really irritating. A good web site with exciting content, that is what I need. Thank you for making this web-site, and I will be visiting again. Do you do newsletters by email? Hi there. I found your site by means of Google at the same time as looking for a comparable topic, your website got here up. It appears great. I’ve bookmarked it in my google bookmarks to come back then. Hiya, I am really glad I have found this information. Nowadays bloggers publish only about gossip and internet stuff and this is actually irritating. A good site with exciting content, this is what I need. Thanks for making this site, and I will be visiting again. Do you do newsletters by email? Hiya, I am really glad I have found this info. Today bloggers publish just about gossip and internet stuff and this is actually irritating. A good blog with interesting content, that’s what I need. Thank you for making this web site, and I will be visiting again. Do you do newsletters by email? Hello there. I discovered your web site by means of Google even as looking for a similar topic, your website came up. It looks good. I have bookmarked it in my google bookmarks to come back then. Hiya, I am really glad I have found this info. Today bloggers publish only about gossip and net stuff and this is really frustrating. A good web site with exciting content, that’s what I need. Thank you for making this site, and I will be visiting again. Do you do newsletters by email? Hi there. I found your web site via Google while looking for a similar topic, your website got here up. It appears good. I have bookmarked it in my google bookmarks to come back then. Thanks a bunch for sharing this with all people you really know what you’re talking about! Bookmarked. Kindly additionally seek advice from my web site =). We could have a link change contract between us! Hiya, I am really glad I’ve found this info. Nowadays bloggers publish only about gossip and web stuff and this is really irritating. A good web site with interesting content, this is what I need. Thanks for making this web-site, and I’ll be visiting again. Do you do newsletters by email? Hello there. I discovered your web site by means of Google even as looking for a similar topic, your web site got here up. It seems great. I’ve bookmarked it in my google bookmarks to visit then. Hiya, I am really glad I have found this info. Today bloggers publish only about gossip and internet stuff and this is really frustrating. A good web site with interesting content, this is what I need. Thanks for making this website, and I’ll be visiting again. Do you do newsletters by email? Hiya, I’m really glad I have found this info. Today bloggers publish just about gossip and net stuff and this is really irritating. A good web site with interesting content, that is what I need. Thanks for making this web site, and I will be visiting again. Do you do newsletters by email? Hey there. I discovered your web site by the use of Google while looking for a related subject, your site came up. It appears to be good. I have bookmarked it in my google bookmarks to come back then. Hi there. I discovered your web site by way of Google at the same time as searching for a comparable topic, your website got here up. It seems great. I have bookmarked it in my google bookmarks to visit then. Hey there. I discovered your blog by the use of Google even as looking for a similar subject, your site came up. It appears to be good. I’ve bookmarked it in my google bookmarks to come back then. Hi there. I discovered your website via Google even as looking for a similar topic, your website got here up. It looks good. I have bookmarked it in my google bookmarks to come back then. Hey there. I discovered your blog by means of Google while searching for a comparable subject, your site got here up. It appears to be good. I’ve bookmarked it in my google bookmarks to come back then. Hey there. I discovered your website via Google even as searching for a comparable topic, your website got here up. It seems to be good. I’ve bookmarked it in my google bookmarks to visit then. Hello there. I discovered your blog by means of Google even as searching for a similar matter, your website got here up. It appears to be great. I’ve bookmarked it in my google bookmarks to come back then. Hi there. I found your blog by the use of Google at the same time as looking for a comparable subject, your web site came up. It looks great. I’ve bookmarked it in my google bookmarks to come back then. Hello there. I discovered your site by means of Google whilst searching for a comparable subject, your site came up. It appears great. I’ve bookmarked it in my google bookmarks to come back then. Hello there. I discovered your blog by the use of Google at the same time as searching for a similar subject, your website got here up. It looks good. I’ve bookmarked it in my google bookmarks to visit then. Whats Taking place i’m new to this, I stumbled upon this I’ve discovered It positively useful and it has aided me out loads. I am hoping to contribute & help different users like its aided me. Great job. Hiya very nice web site!! Guy .. Beautiful .. Amazing .. I’ll bookmark your web site and take the feeds also¡KI am satisfied to seek out a lot of useful info here in the submit, we need develop extra techniques in this regard, thanks for sharing. . . . . .
Hiya, I am really glad I have found this information. Today bloggers publish only about gossip and web stuff and this is actually irritating. A good site with interesting content, that’s what I need. Thanks for making this website, and I’ll be visiting again. Do you do newsletters by email? Hiya, I’m really glad I’ve found this info. Today bloggers publish only about gossip and internet stuff and this is actually frustrating. A good blog with interesting content, that’s what I need. Thank you for making this web-site, and I will be visiting again. Do you do newsletters by email? Hello there. I found your website via Google at the same time as looking for a similar matter, your web site came up. It seems to be good. I have bookmarked it in my google bookmarks to visit then. Hello there. I found your website by the use of Google whilst searching for a related topic, your website got here up. It looks good. I have bookmarked it in my google bookmarks to come back then. Hey there. I found your site by means of Google at the same time as looking for a related topic, your website got here up. It appears to be great. I’ve bookmarked it in my google bookmarks to come back then. Hiya, I’m really glad I have found this information. Nowadays bloggers publish just about gossip and net stuff and this is really frustrating. A good site with interesting content, this is what I need. Thanks for making this web site, and I will be visiting again. Do you do newsletters by email? Needed to post you this little bit of observation to finally say thank you over again over the lovely ideas you’ve discussed on this page. It has been certainly extremely generous with people like you to allow openly exactly what a few individuals would’ve made available for an ebook to help make some bucks on their own, especially given that you might have done it in case you considered necessary. The advice likewise served like the easy way to be certain that other people have the same zeal the same as my personal own to grasp great deal more in respect of this condition. I’m sure there are numerous more enjoyable sessions in the future for individuals who start reading your blog post. Hi there. I discovered your site by way of Google while looking for a comparable matter, your web site got here up. It seems to be great. I’ve bookmarked it in my google bookmarks to come back then. Hey there. I discovered your site via Google even as looking for a comparable matter, your site came up. It appears great. I’ve bookmarked it in my google bookmarks to visit then. Hey there. I discovered your site by way of Google whilst searching for a similar matter, your site got here up. It appears to be great. I have bookmarked it in my google bookmarks to come back then. Hi there. I discovered your web site via Google whilst searching for a related subject, your site came up. It appears to be great. I have bookmarked it in my google bookmarks to come back then. What i don’t understood is in fact how you are not actually much more well-appreciated than you may be now. You’re very intelligent. You understand therefore significantly relating to this topic, produced me personally consider it from so many various angles. Its like men and women don’t seem to be involved unless it is one thing to accomplish with Woman gaga! Your personal stuffs excellent. At all times deal with it up! Hiya, I am really glad I’ve found this info. Today bloggers publish only about gossip and internet stuff and this is actually annoying. A good website with interesting content, that’s what I need. Thanks for making this web site, and I’ll be visiting again. Do you do newsletters by email? Hiya, I am really glad I have found this information. Nowadays bloggers publish only about gossip and web stuff and this is really frustrating. A good website with exciting content, this is what I need. Thank you for making this website, and I will be visiting again. Do you do newsletters by email? I do accept as true with all of the concepts you’ve offered on your post. They are really convincing and can definitely work. Still, the posts are too brief for newbies. May just you please lengthen them a little from next time? Thank you for the post. Hiya, I’m really glad I have found this info. Nowadays bloggers publish only about gossip and internet stuff and this is actually annoying. A good web site with exciting content, this is what I need. Thank you for making this site, and I’ll be visiting again. Do you do newsletters by email? Hello there. I found your blog by the use of Google even as looking for a related topic, your website came up. It seems great. I have bookmarked it in my google bookmarks to visit then. Hi, Neat post. There’s a problem along with your site in web explorer, might test this… IE nonetheless is the market chief and a large section of other people will miss your excellent writing due to this problem. Hello there. I found your site by the use of Google while looking for a similar topic, your web site came up. It seems to be good. I have bookmarked it in my google bookmarks to come back then. Hiya, I am really glad I’ve found this info. Today bloggers publish only about gossip and internet stuff and this is actually irritating. A good blog with interesting content, that’s what I need. Thanks for making this web-site, and I’ll be visiting again. Do you do newsletters by email? Hello there. I discovered your blog by means of Google while searching for a similar matter, your site got here up. It appears to be great. I’ve bookmarked it in my google bookmarks to visit then. Great tremendous things here. I am very satisfied to peer your post. Thanks so much and i am having a look ahead to contact you. Will you kindly drop me a e-mail? Hi there. I discovered your blog by the use of Google even as searching for a similar matter, your web site got here up. It appears to be good. I’ve bookmarked it in my google bookmarks to come back then. Hey there. I discovered your blog by means of Google at the same time as searching for a similar matter, your site got here up. It appears to be good. I’ve bookmarked it in my google bookmarks to visit then. Hello there. I found your site by the use of Google whilst looking for a similar topic, your website came up. It seems to be great. I’ve bookmarked it in my google bookmarks to visit then. Hiya, I’m really glad I’ve found this info. Nowadays bloggers publish only about gossip and net stuff and this is actually frustrating. A good site with exciting content, that’s what I need. Thanks for making this website, and I’ll be visiting again. Do you do newsletters by email? Hey there. I found your site by way of Google even as looking for a comparable subject, your web site came up. It seems to be good. I have bookmarked it in my google bookmarks to come back then. Hey there. I found your site by the use of Google at the same time as searching for a related matter, your web site got here up. It seems good. I have bookmarked it in my google bookmarks to visit then. Hello there. I discovered your blog by means of Google even as searching for a similar topic, your web site got here up. It seems great. I have bookmarked it in my google bookmarks to visit then. Hey there. I discovered your blog via Google even as looking for a comparable topic, your website got here up. It seems great. I’ve bookmarked it in my google bookmarks to come back then. Hi there. I discovered your blog by means of Google at the same time as searching for a related topic, your website came up. It looks great. I’ve bookmarked it in my google bookmarks to visit then. Hello there. I discovered your blog by way of Google at the same time as searching for a comparable topic, your web site came up. It seems good. I’ve bookmarked it in my google bookmarks to come back then. I am just writing to make you know of the beneficial experience my friend’s daughter encountered studying the blog. She figured out some details, including what it’s like to have an incredible coaching character to let the rest completely have an understanding of specific problematic subject matter. You truly exceeded readers’ expectations. I appreciate you for offering such warm and helpful, trusted, explanatory and as well as unique tips about the topic to Sandra. Hello there. I discovered your web site by the use of Google at the same time as searching for a related matter, your web site got here up. It appears to be good. I’ve bookmarked it in my google bookmarks to come back then. Hey there. I discovered your website by the use of Google at the same time as looking for a similar subject, your site came up. It appears to be great. I have bookmarked it in my google bookmarks to visit then. Hello there. I found your blog by way of Google whilst searching for a related topic, your website came up. It appears good. I have bookmarked it in my google bookmarks to come back then. Hello there. I found your site by the use of Google whilst searching for a related topic, your web site got here up. It appears great. I’ve bookmarked it in my google bookmarks to visit then. Hello there. I discovered your blog via Google at the same time as looking for a comparable subject, your website got here up. It appears to be good. I’ve bookmarked it in my google bookmarks to visit then. Just want to say your article is as astonishing. The clarity in your post is just spectacular and i could assume you’re an expert on this subject. Well with your permission allow me to grab your RSS feed to keep updated with forthcoming post. Thanks a million and please keep up the rewarding work. Hi there. I discovered your web site by way of Google even as looking for a similar matter, your web site got here up. It looks good. I’ve bookmarked it in my google bookmarks to come back then. Hey there. I found your blog by the use of Google whilst searching for a related topic, your site came up. It seems good. I’ve bookmarked it in my google bookmarks to come back then. Hey there. I discovered your website by way of Google whilst searching for a comparable topic, your site got here up. It appears great. I’ve bookmarked it in my google bookmarks to come back then. Hi there. I discovered your site by the use of Google whilst searching for a comparable matter, your web site came up. It looks good. I have bookmarked it in my google bookmarks to visit then. Hiya, I’m really glad I’ve found this info. Nowadays bloggers publish just about gossip and web stuff and this is really irritating. A good web site with interesting content, this is what I need. Thank you for making this web-site, and I’ll be visiting again. Do you do newsletters by email? Hello there. I found your site by way of Google while looking for a comparable subject, your website got here up. It appears good. I’ve bookmarked it in my google bookmarks to come back then. Hey there. I discovered your website by means of Google at the same time as searching for a similar topic, your web site got here up. It looks great. I have bookmarked it in my google bookmarks to come back then. Hi there. I discovered your blog via Google even as searching for a similar subject, your web site came up. It seems good. I have bookmarked it in my google bookmarks to visit then. Hi there. I found your web site by way of Google at the same time as searching for a related subject, your site came up. It looks good. I’ve bookmarked it in my google bookmarks to visit then. Hey there. I discovered your blog via Google while looking for a related matter, your web site came up. It appears to be great. I’ve bookmarked it in my google bookmarks to come back then. Hello there. I discovered your site via Google at the same time as looking for a similar topic, your website got here up. It seems good. I’ve bookmarked it in my google bookmarks to come back then. Hiya, I’m really glad I have found this information. Nowadays bloggers publish just about gossip and net stuff and this is really irritating. A good website with interesting content, that’s what I need. Thank you for making this site, and I will be visiting again. Do you do newsletters by email? Hi there. I found your blog by way of Google at the same time as looking for a comparable subject, your web site got here up. It seems great. I have bookmarked it in my google bookmarks to visit then. Hiya, I am really glad I have found this info. Today bloggers publish only about gossip and internet stuff and this is really frustrating. A good blog with interesting content, that is what I need. Thanks for making this web-site, and I will be visiting again. Do you do newsletters by email? Hello there. I found your blog by way of Google at the same time as looking for a comparable matter, your web site got here up. It seems to be great. I’ve bookmarked it in my google bookmarks to come back then. Hey there. I found your web site by means of Google even as searching for a similar subject, your web site came up. It seems good. I have bookmarked it in my google bookmarks to come back then. Hiya, I am really glad I’ve found this information. Today bloggers publish only about gossip and internet stuff and this is really frustrating. A good website with exciting content, that’s what I need. Thanks for making this website, and I’ll be visiting again. Do you do newsletters by email? Hi there. I found your web site by the use of Google whilst looking for a comparable subject, your website got here up. It seems great. I’ve bookmarked it in my google bookmarks to visit then. Hi there. I discovered your web site via Google while looking for a related topic, your web site got here up. It appears to be good. I’ve bookmarked it in my google bookmarks to visit then. Hiya, I am really glad I have found this info. Today bloggers publish only about gossip and net stuff and this is really annoying. A good web site with exciting content, this is what I need. Thank you for making this web site, and I’ll be visiting again. Do you do newsletters by email? Hi there. I discovered your website by means of Google at the same time as searching for a similar topic, your site came up. It looks good. I have bookmarked it in my google bookmarks to visit then. Hiya, I am really glad I’ve found this info. Nowadays bloggers publish only about gossip and net stuff and this is really annoying. A good site with interesting content, that’s what I need. Thanks for making this site, and I will be visiting again. Do you do newsletters by email? Normally I don’t learn article on blogs, however I wish to say that this write-up very forced me to take a look at and do it! Your writing taste has been amazed me. Thank you, quite nice article. Hiya, I am really glad I have found this information. Nowadays bloggers publish just about gossip and internet stuff and this is actually irritating. A good web site with interesting content, that is what I need. Thanks for making this web site, and I’ll be visiting again. Do you do newsletters by email? Hiya, I am really glad I’ve found this info. Today bloggers publish just about gossip and web stuff and this is actually frustrating. A good site with interesting content, that is what I need. Thank you for making this web-site, and I will be visiting again. Do you do newsletters by email? Hi there. I found your website by the use of Google whilst searching for a related matter, your website got here up. It looks good. I’ve bookmarked it in my google bookmarks to visit then. Hello there. I discovered your blog by way of Google at the same time as looking for a related matter, your site got here up. It looks good. I have bookmarked it in my google bookmarks to visit then. I¡¦ve learn a few excellent stuff here. Definitely worth bookmarking for revisiting. I wonder how a lot attempt you set to create the sort of wonderful informative site. Hi there. I discovered your blog via Google even as searching for a similar matter, your web site got here up. It seems great. I have bookmarked it in my google bookmarks to visit then. Hey there. I discovered your blog via Google while looking for a related topic, your site came up. It appears good. I’ve bookmarked it in my google bookmarks to come back then. Hi there. I discovered your blog by means of Google whilst searching for a related topic, your website got here up. It seems to be good. I have bookmarked it in my google bookmarks to come back then. Hiya, I am really glad I have found this information. Today bloggers publish only about gossip and internet stuff and this is actually annoying. A good website with interesting content, this is what I need. Thanks for making this site, and I will be visiting again. Do you do newsletters by email? Hi, Neat post. There’s a problem together with your web site in web explorer, might test this… IE still is the marketplace leader and a large component of folks will miss your great writing due to this problem. Hiya, I am really glad I’ve found this info. Nowadays bloggers publish only about gossip and net stuff and this is really frustrating. A good blog with exciting content, that’s what I need. Thank you for making this site, and I will be visiting again. Do you do newsletters by email? Hi there. I found your blog by way of Google while searching for a comparable topic, your website came up. It appears great. I have bookmarked it in my google bookmarks to visit then. Hiya, I’m really glad I have found this information. Today bloggers publish only about gossip and internet stuff and this is actually irritating. A good blog with exciting content, that is what I need. Thank you for making this site, and I’ll be visiting again. Do you do newsletters by email? Hello there. I discovered your site by the use of Google whilst searching for a related matter, your site got here up. It appears to be good. I’ve bookmarked it in my google bookmarks to visit then. Hiya, I am really glad I have found this info. Nowadays bloggers publish just about gossip and net stuff and this is actually annoying. A good blog with interesting content, that’s what I need. Thank you for making this web site, and I’ll be visiting again. Do you do newsletters by email? Hey there. I found your website by way of Google while looking for a similar topic, your website got here up. It appears good. I’ve bookmarked it in my google bookmarks to come back then. Hi there. I found your blog via Google while looking for a related subject, your website came up. It appears great. I’ve bookmarked it in my google bookmarks to visit then. Hello there. I found your web site by way of Google at the same time as looking for a related subject, your web site got here up. It seems good. I’ve bookmarked it in my google bookmarks to visit then. hello!,I like your writing so a lot! share we be in contact extra about your post on AOL? I require a specialist in this house to unravel my problem. May be that is you! Looking forward to look you. I simply wanted to thank you very much all over again. I do not know the things that I could possibly have sorted out in the absence of these recommendations discussed by you directly on this question. Certainly was an absolute frightful concern in my view, nevertheless witnessing this specialised mode you resolved that took me to cry over joy. Now i am thankful for the guidance and in addition hope that you realize what an amazing job you are always carrying out training the others through the use of your website. Most probably you haven’t got to know all of us. I was just looking for this information for a while. After 6 hours of continuous Googleing, finally I got it in your site. I wonder what is the lack of Google strategy that do not rank this kind of informative web sites in top of the list. Usually the top web sites are full of garbage. A person necessarily help to make critically posts I might state. This is the very first time I frequented your web page and thus far? I surprised with the analysis you made to make this particular put up extraordinary. Great task! You really make it seem so easy together with your presentation but I in finding this matter to be really something which I feel I might never understand. It seems too complex and very large for me. I’m having a look forward in your subsequent submit, I will attempt to get the cling of it! Cuando se elimina una capa de material en uno de los lados de una placa plana que contiene tensiones residuales, se altera el equilibrio de tensiones en la placa de manera que ésta de deforma tras liberar las fuerzas de amarre para alcanzar un nuevo estado de equilibrio (figura 3). La curvatura alcanzada por la placa depende de la distribución de tensiones originalmente presente en la capa eliminada, así como de las propiedades elásticas de del resto de la placa. Hi there. I discovered your web site by means of Google at the same time as looking for a related topic, your web site came up. It seems to be great. I’ve bookmarked it in my google bookmarks to visit then. Hey there. I discovered your blog by way of Google while searching for a related subject, your site came up. It appears good. I’ve bookmarked it in my google bookmarks to visit then. Hiya, I’m really glad I have found this information. Nowadays bloggers publish just about gossip and net stuff and this is actually frustrating. A good site with interesting content, this is what I need. Thanks for making this site, and I will be visiting again. Do you do newsletters by email? Hiya, I’m really glad I’ve found this information. Today bloggers publish just about gossip and net stuff and this is actually annoying. A good site with exciting content, this is what I need. Thank you for making this website, and I will be visiting again. Do you do newsletters by email? Hi there. I discovered your web site by way of Google even as looking for a related subject, your site got here up. It appears good. I’ve bookmarked it in my google bookmarks to come back then. I am just commenting to let you know what a beneficial encounter my cousin’s princess had studying the blog. She even learned a lot of things, including what it is like to possess an ideal teaching heart to make many others with no trouble fully understand some grueling matters. You actually surpassed visitors’ expectations. Many thanks for distributing the precious, healthy, explanatory and even easy tips on your topic to Kate. Hiya, I am really glad I’ve found this information. Today bloggers publish only about gossip and net stuff and this is really frustrating. A good web site with interesting content, that’s what I need. Thank you for making this site, and I’ll be visiting again. Do you do newsletters by email? Hello there. I found your website by the use of Google whilst searching for a related matter, your website got here up. It seems to be good. I’ve bookmarked it in my google bookmarks to visit then. Hey there. I found your website by the use of Google even as searching for a related matter, your web site came up. It looks great. I’ve bookmarked it in my google bookmarks to visit then. Hello there. I found your site via Google while looking for a comparable topic, your web site got here up. It seems to be great. I’ve bookmarked it in my google bookmarks to visit then. Thanks, I’ve just been looking for info approximately this topic for ages and yours is the greatest I have found out so far. But, what about the conclusion? Are you certain concerning the source? Hello there. I discovered your site via Google even as searching for a related subject, your web site came up. It appears to be good. I have bookmarked it in my google bookmarks to come back then. I will immediately seize your rss as I can not find your e-mail subscription hyperlink or e-newsletter service. Do you have any? Kindly allow me realize so that I could subscribe. Thanks. Good ¡V I should definitely pronounce, impressed with your website. I had no trouble navigating through all tabs as well as related information ended up being truly simple to do to access. I recently found what I hoped for before you know it in the least. Quite unusual. Is likely to appreciate it for those who add forums or something, website theme . a tones way for your customer to communicate. Nice task..
Hiya, I am really glad I’ve found this information. Today bloggers publish just about gossip and net stuff and this is actually frustrating. A good site with exciting content, that is what I need. Thank you for making this web site, and I’ll be visiting again. Do you do newsletters by email? Thanks so much for providing individuals with a very breathtaking opportunity to read articles and blog posts from this website. It really is very good and jam-packed with fun for me personally and my office co-workers to search your blog not less than 3 times in one week to find out the fresh issues you have. And lastly, I’m usually amazed considering the exceptional points you serve. Certain 3 tips in this posting are in truth the most impressive we have all had. Excellent website. Lots of useful info here. I¡¦m sending it to some pals ans additionally sharing in delicious. And obviously, thank you for your effort! Hello there. I found your blog by means of Google even as searching for a similar subject, your web site got here up. It seems to be good. I’ve bookmarked it in my google bookmarks to come back then. Hello there. I discovered your website by way of Google whilst searching for a comparable topic, your web site came up. It seems good. I’ve bookmarked it in my google bookmarks to visit then. Hello there. I discovered your website by the use of Google at the same time as looking for a similar topic, your website got here up. It appears good. I have bookmarked it in my google bookmarks to come back then. Hello there. I discovered your site via Google while looking for a related matter, your site got here up. It seems great. I’ve bookmarked it in my google bookmarks to visit then. Good day very cool website!! Man .. Beautiful .. Wonderful .. I will bookmark your blog and take the feeds also…I am happy to search out so many helpful information right here in the put up, we’d like work out extra techniques on this regard, thanks for sharing. Hey there. I found your website by way of Google whilst looking for a similar matter, your web site got here up. It seems to be great. I’ve bookmarked it in my google bookmarks to come back then. Hey there. I found your blog by the use of Google whilst searching for a related matter, your web site came up. It appears to be great. I have bookmarked it in my google bookmarks to come back then. Hello my loved one! I want to say that this article is awesome, nice written and include almost all important infos. I would like to peer extra posts like this. whoah this weblog is fantastic i love studying your articles. Stay up the great work! You already know, a lot of individuals are hunting around for this information, you can help them greatly. Hi there. I found your web site by the use of Google at the same time as looking for a comparable subject, your web site came up. It seems to be great. I have bookmarked it in my google bookmarks to visit then. Hi there. I found your website by way of Google whilst searching for a related matter, your site got here up. It appears to be great. I’ve bookmarked it in my google bookmarks to visit then. Hey there. I found your website by the use of Google even as searching for a similar matter, your website came up. It looks great. I’ve bookmarked it in my google bookmarks to visit then. Hi there. I found your site by way of Google while looking for a related subject, your site got here up. It looks great. I’ve bookmarked it in my google bookmarks to come back then. you are really a good webmaster. The site loading speed is amazing. It sort of feels that you’re doing any unique trick. Also, The contents are masterwork. you’ve done a fantastic job in this topic! You really make it appear so easy along with your presentation but I find this topic to be actually something that I believe I might never understand. It kind of feels too complicated and very wide for me. I’m having a look forward on your next submit, I¡¦ll attempt to get the cling of it! Hi there. I discovered your blog by means of Google while searching for a related topic, your web site came up. It looks good. I’ve bookmarked it in my google bookmarks to visit then. Hello there. I discovered your website via Google even as looking for a comparable topic, your site got here up. It looks great. I have bookmarked it in my google bookmarks to come back then. What i don’t realize is in reality how you are not actually a lot more neatly-liked than you may be right now. You are very intelligent. You already know thus considerably relating to this topic, made me personally consider it from a lot of numerous angles. Its like men and women don’t seem to be involved except it is something to do with Girl gaga! Your own stuffs nice. Always take care of it up! Hiya, I am really glad I’ve found this info. Nowadays bloggers publish only about gossip and web stuff and this is really annoying. A good blog with interesting content, this is what I need. Thanks for making this site, and I’ll be visiting again. Do you do newsletters by email? Hello there. I discovered your website by the use of Google while looking for a similar subject, your web site got here up. It looks good. I have bookmarked it in my google bookmarks to come back then. Hiya, I am really glad I’ve found this info. Nowadays bloggers publish just about gossips and internet and this is really annoying. A good website with exciting content, this is what I need. Thank you for keeping this site, I will be visiting it. Do you do newsletters? Can’t find it. Helpful info. Lucky me I discovered your website accidentally, and I’m surprised why this accident did not came about earlier! I bookmarked it. Hi there. I discovered your website via Google even as looking for a comparable subject, your website came up. It appears great. I’ve bookmarked it in my google bookmarks to visit then. Normally I do not read article on blogs, but I would like to say that this write-up very compelled me to check out and do so! Your writing style has been surprised me. Thank you, very great article.